The new product, dubbed EC-Oil 80, is an automatic hydraulic connector suitable for the Q-Safe 80 quick hitch for excavators up to 40 tonnes and for large, high-flow tools. 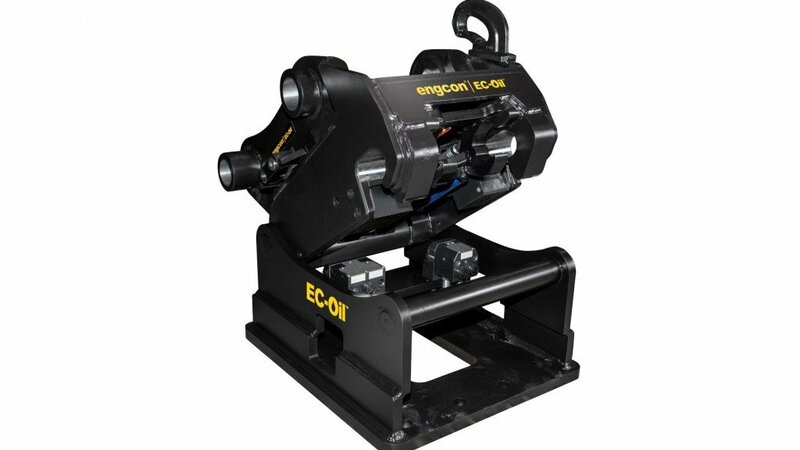 In 2018 Engcon announced it had begun testing the EC-Oil 80 prototype, the largest of its automatic hydraulic connector models. It enables the operator to remain seated in the excavator when connecting or disconnecting the tiltrotator and other hydraulic tools. Jumping in and out of the machine and struggling with awkward, pressurized, messy hydraulic connectors is a thing of the past. During the spring of 2019, EC-Oil 80 will be ready for full-scale production. Automatic hydraulic oil connection to the quick hitch and tiltrotators will thus be accessible in the QS45-QS80 sizes, and will come as standard and free of charge when the customer simultaneously purchases a machine hitch, tiltrotator & DC2 control system. "There is great demand for an automatic quick hitch for large excavators as the large manual hydraulic connectors from ¾ inch and up are heavy and difficult to handle," says Fredrik Jonsson, R&D manager at Engcon Group. The Q-Safe 80 will be the most powerful automatic quick hitch Engcon has developed and it will come standard with an EC-Oil 70 block and two ¾ inch connectors and connections for electrical power and central lubrication. This will meet many requirements and allow automatic connection to Engcon's tiltrotators with equivalent EC-Oil connectors. In addition to the standard configuration, the Q-Safe 80 quick hitch can also be fitted with an EC-Oil 80 block with two one-inch hydraulic connectors, and 1/2-inch hydraulic connector and two electrical power connections. This configuration will allow hydraulic flows of up to 250 litres through the Q-Safe 80 quick hitch. "Should even more flow be necessary, we can replace the EC-Oil 70 block with an additional EC-Oil 80 block. This lets us reach a flow of 300 litres, enabling the connection of large, high-flow hydraulic tools," says Jonsson. Engcon's hydraulic tools, compactors, sorting buckets, timber grabs, rotating brushes and pallet forks can be factory-fitted with EC-Oil automatic hydraulic connectors. Engcon also offers upper section adapters that can be welded or bolted on to the customer's existing hydraulic tools.